Preventing a thatch fire is important because they are designed to shed water and are notoriously difficult to extinguish. 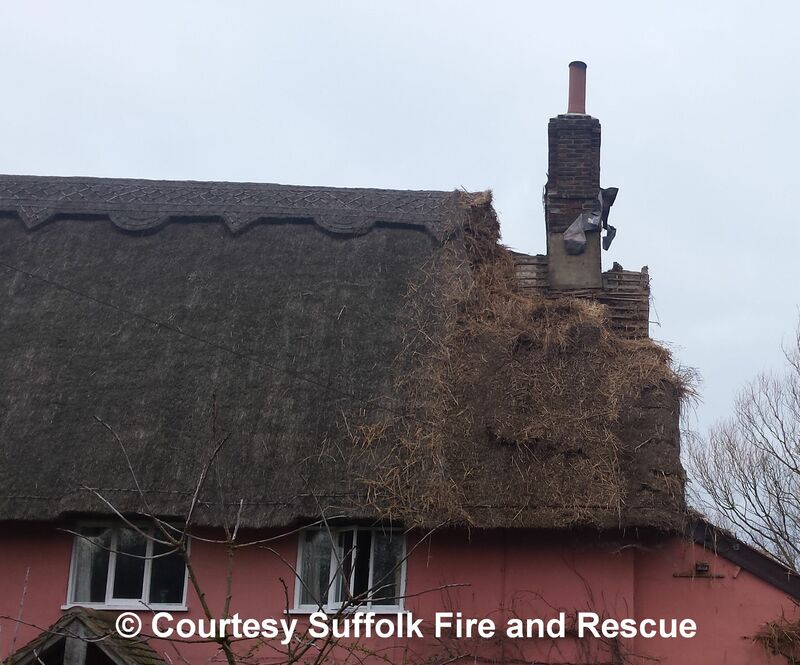 Please read our Thatch Fire Safety Leaflet which gives an excellent summary of advice. 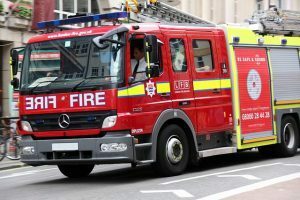 We have updated our information on the main causes of thatch fires and therefore the main risks and highlighted that the old information on the heat transfer theory has not been proven by Forensic Investigation of 148 thatch fires nor the Fire Prevention Association research into chimneys, thatch and woodburners. The investigations and research have confirmed what we have already been promoting, that ejected embers and chimney fires are the greatest risk to thatch properties and that woodburner installations with a low chimney increase that risk. Do not just line your chimney. Look at how you burn in your fire or wood-burner, avoid build up of tars in chimney. Run your woodburners at manufacturers recommended conditions. Avoid aggressive ventilation. Chimney integrity is important. Check with CCTV for open fires with an unlined chimney and check the liners themselves. 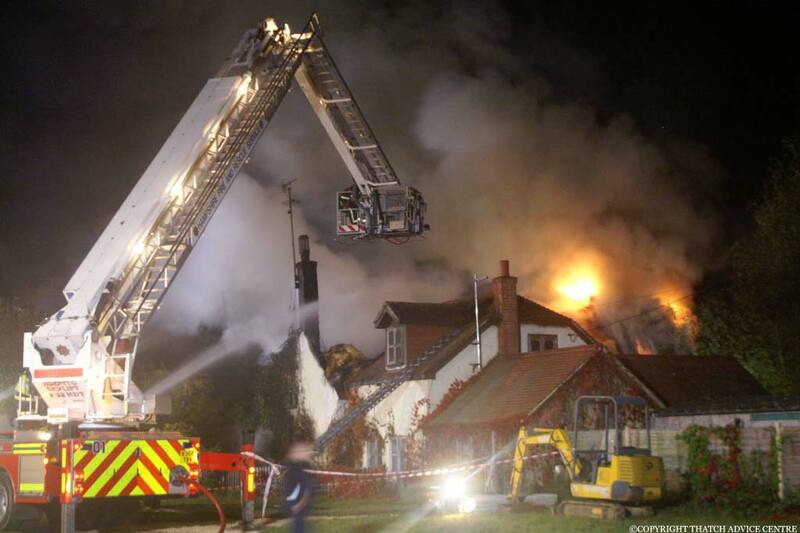 Other advice which helps in reducing the risk of thatch Fire is in our Thatch Fire Safety leaflet. Make sure that your insurance cover requirements on fire safety are also met. 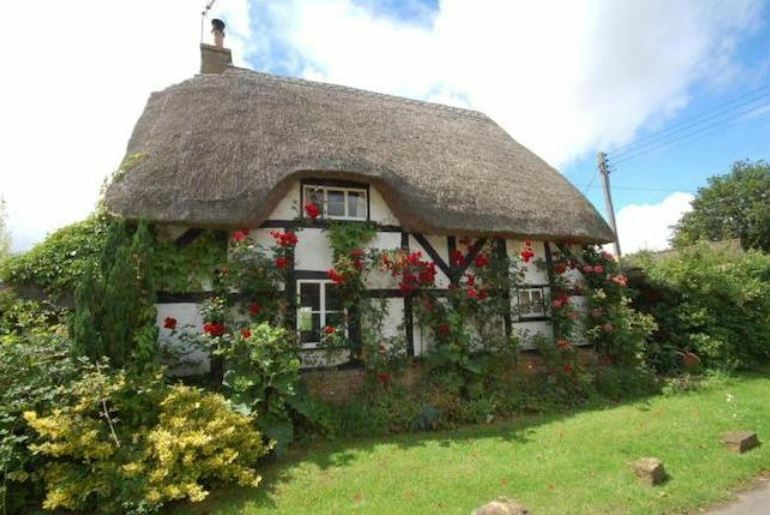 These requirements may vary due to the bespoke nature of many specialist policies and individual thatched properties. There are fire safety products on the market, some are specialised products designed with thatch in mind, others are building products used on thatched properties. You need to assess your individual property and its risks and then make an informed choice on how you reduce those risks. Use common sense, take precautions and feel free to get in touch with us for expert, up to date advice. As previously mentioned, read the Thatch Advice Centre Fire Safety Leaflet as a starting point and then you can look at products to reduce the risk. Fire Sprays are applied to help prevent a fire starting. Fire barriers, alarms and suppressants are protection, notification and assistance for when a fire has started. Obviously, we want to reduce the risk of a fire starting in the first place. So if a fire has started you can have an alarm and, in some cases, start suppressing the fire until the fire service arrive. Certain insurers offer premium reductions and in some cases product discounts for customers. Remember, thatch is not more likely to catch fire than other properties it is just harder to put out and makes more mess if it does. Thatch Fire prevention is the best course of action. See Fire Safety Products and Supplies on our new Thatch Directory. These are sprayed on the outside of the completed thatch, give protection from embers and sparks from chimney, bonfire, fireworks and Chinese lanterns. 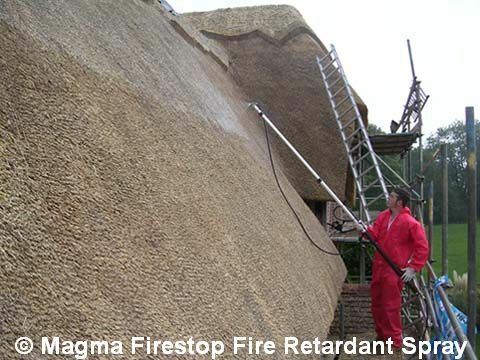 E.g Magma Firestop Fire retardant spray which should only be applied on a dry roof on a dry day. Treatment Certificates should be provided as proof of certified application and are often required for insurance purposes. Re-application is generally every 5 – 7 years due to the natural degradation of the thatch. Magma Firestop also has fire retardant sprays for internal thatch and timber. There are several systems which offer heat warnings around the chimney area. There are also heat monitors for use with Woodburners, and systems to check flue temperatures, helping indicate the risk of a chimney fire. There are a few alarms with a probe or heat sensor around the chimney area to give notification when heat is becoming critical. There are chimney fire suppressants e.g Chimfire Stop, which may help reducing the risk of ejected embers in the case of a chimney fire, and giving more time for the fire service to attend. There is a linear alarm system which also have associated fire suppression system (not water) should they be activated. Sprinkler systems – Systems which create a mist are now being looked at for thatched properties as ways to help in the event of a fire. Watch this space for more information. 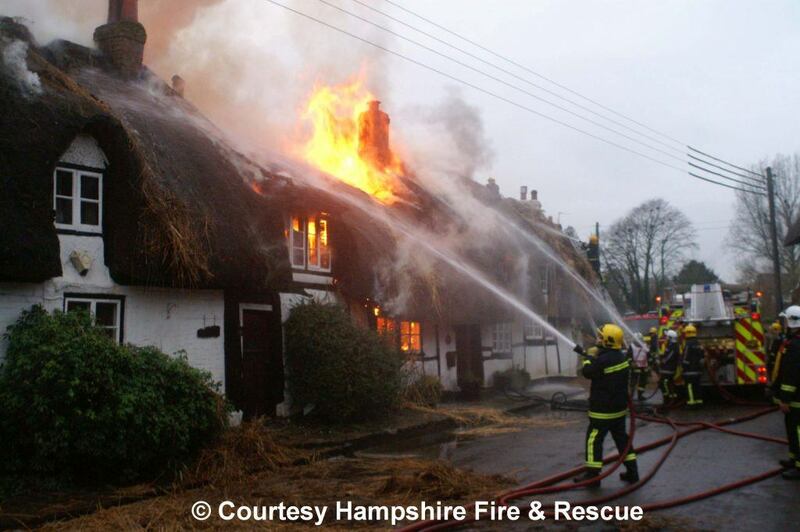 The problem of thatch being designed to repel water has always been tricky in the fight against thatched fires. 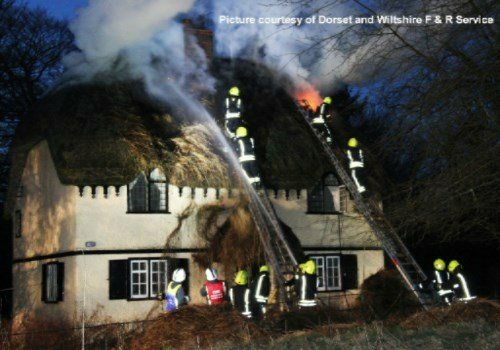 Whether you have a thatched property or not, Smoke and Carbon Monoxide Alarms are important. Other alarm systems e.g heat alarms, may be incorporated into general alarm systems or stand alone. Join us on Social media using the hastags #TestItTuesday and #PressToTest for reminders on checking alarms. There are various barriers available which all achieve different things due to their individual composition eg what they are made of. The aim is to provide protection over the rafters and underneath the thatch and meet the B4 Building Regulation for boundary distances less than 6m e.g.Thatch Safe and Supalux. This means that they can only be applied to a new roof or one that has been stripped down to timbers. The aim is to provide a barrier to the rafters and rest of the building should the thatch catch fire. It is important that you understand what barriers are on offer and what they achieve. Fire test information can often be confusing and misleading so care should be taken in choosing of products. Identify your requirements, make sure the product meets those requirements and then you can make an informed choice. If you are uncertain or have any questions please ask. You don’t want to be like the person who contacted us who had put up the wrong fire barrier on their extension (one which did not meet the building regulations) and had completed the thatching works, only to find the thatch had to be removed and the fire barrier replaced with an appropriate one. A costly mistake. Be aware of insulation requirements on new buildings which go along with fire barrier requirements. Fire barriers are there to extend protection of the property in the event of a thatch fire to give time for the fire service to attend. The thatch is always deemed sacrificial. These are general building products used on thatched buildings. Solid boards are one way to meet the B4 building regulation of ‘rafters being overdrawn with a minimum 1/2 hour fire resistant barrier’. A fire barrier must have both insulation and integrity to meet this fire resistant criteria. The Dorset Model advocate use of a solid fire board e.g Supalux (which may require additional insulation depending on your requirements). Be aware that these boards do not really allow the thatch to breathe. Previously the Dorset Model regulations stipulated use of counter battens in order to allow air flow and now they don’t. Presumably this is either because counter battens create a potential chimney effect if the roof does catch fire or because of the potential for dew points which could make the thatch damp on the inside – neither of which were preferable. Design of the building and incorporation of ventilation is paramount so condensation problems are reduced. These boards are quite heavy and tricky to fit. It is easier on a new roof which is straight. Intumescent mastic it recommended on the joints. The joints are important in that the integrity of the board must be maintained as part of the fitting. They generally give a minimum 1 hour barrier. There is a difference between the insulated fire barrier above and thinner ‘material like’ barriers (which hold back flames but not the heat). A simple test is to put your hand one side and the flame from a cigarette lighter the other. It is important to be aware that these material type barriers would require additional insulation over the rafters to really protect from fire and also are not very breathable. Consider again the need for roofs to breathe in making your decision. Again please be aware of thin barriers with no insulation not meeting Building Regulations – we have had homeowners in trouble with Building Inspectors where a thin barrier is applied, then the thatch and then they find out it is not approved. These are costly mistakes. See above. If you need any more information, please contact us. We are always happy to help with Thatch Fire Safety questions.